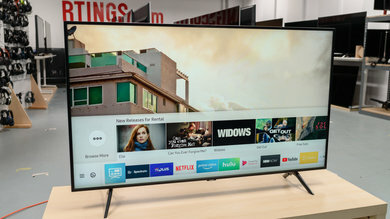 43" 55" 60" 65" 70"
The Vizio D Series 2018 is a decent but basic 4k TV. 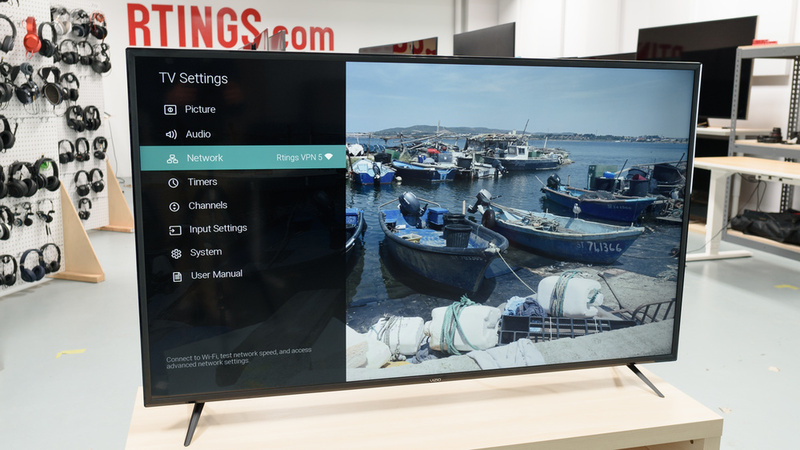 The picture quality is okay, but the TV lacks more advanced features like local dimming or a wide color gamut to produce deeper dark scenes or vivid HDR. 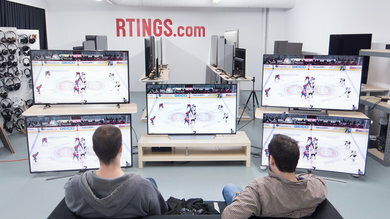 The response time is fast which is excellent for displaying sports without much blur and the TV has low input lag for gaming. 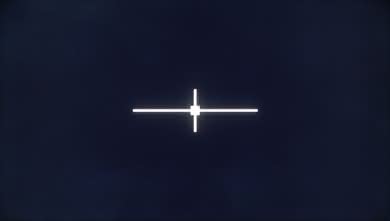 Update 3/29/2019: We corrected a mistake in the BFI score. 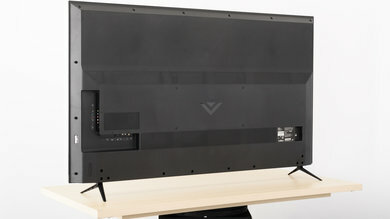 The design of the Vizio D Series 65 is ok. It has a wide and quite stable stand, although it wobbles a little if slightly pushed. The back is plastic and the TV seems relatively thick when you are looking at it from the side. The build quality is ok and it should not cause any issues. 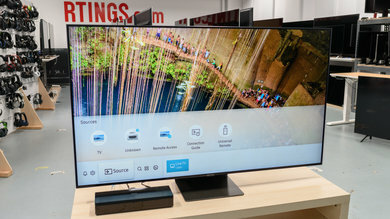 Overall, the TV looks very similar to the Vizio E Series 2018, but the D Series lacks a metal trim. 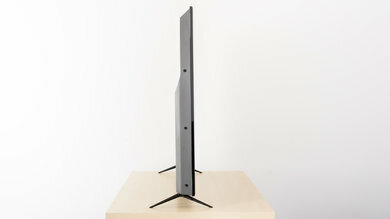 The stand of the Vizio D Series 4k 2018 is plastic and provides good support to the TV. However, the TV will wobble slightly back and forth if pushed gently. Footprint of the 55" model: 50.6" x 10.6"
The back of the TV is plastic. It has a more sleek look and the inputs are still split between the side and the bottom edge, which makes them easier to access if you wall mount the TV. There is no planning for cable management. The borders are simple. They have a textured plastic finish and average thickness. They look identical to E series 2018 but they lack the silver trim on the bottom edge. 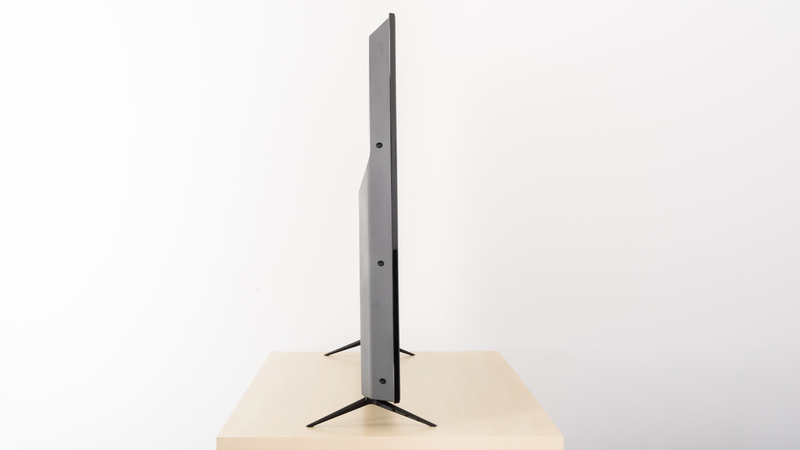 The TV looks a little thick and blocky when viewed from the side, so it may stick out slightly if wall-mounted. Like all other Vizio models we tested this year, the structure of the TV (screen and electronics' compartment) is more apparent when the TV is viewed from the side. 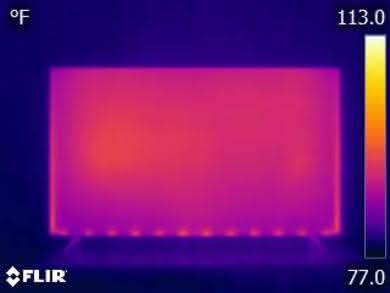 This TV operates at a relatively low temperature and the panel remains uniformly cool to the touch. The build quality is ok. It feels solid even though it is almost entirely made from plastic. There are no gaps in the built and you should have no problems with it. The Vizio D Series produces a decent picture quality. 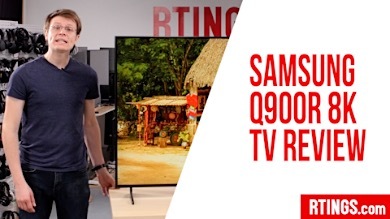 It has a very good native contrast ratio that will display deep blacks in dark room conditions and the TV can get bright enough for dim environments. However, in well-lit rooms, it might not be able to get bright enough. 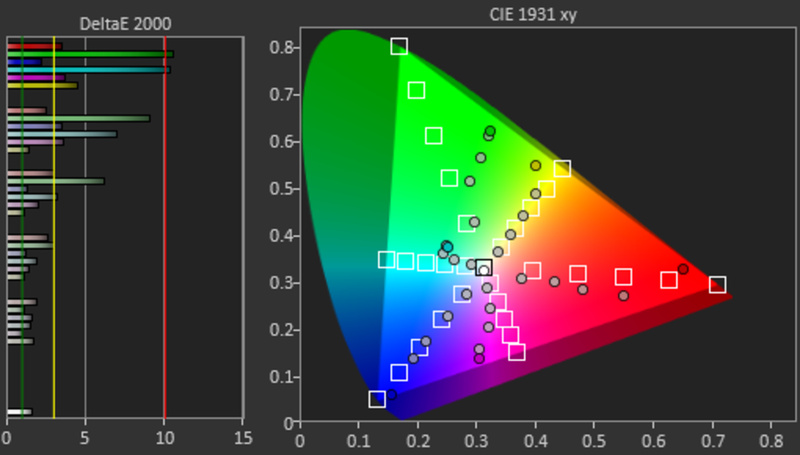 When viewing HDR content, you might find the picture slightly dim unless you boost the backlight.  The gray uniformity is ok, however, some clouding is noticeable and this might annoy sports fans. It has a limited color gamut, and poor color volume, so you should not expect rich and saturated colors. 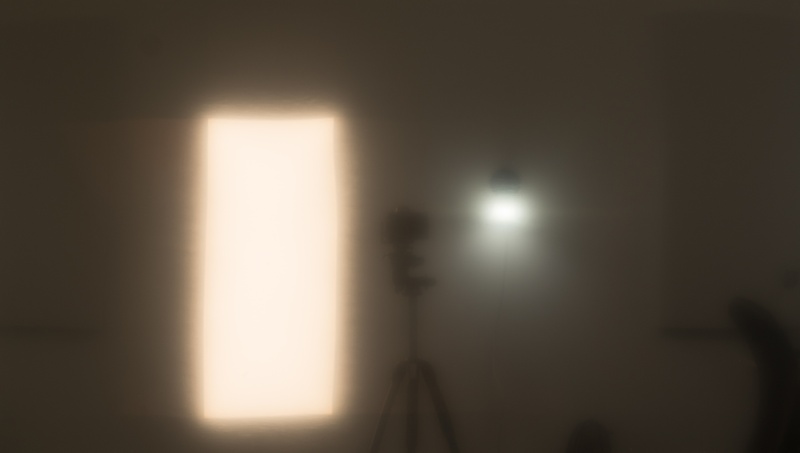 Finally, reflection handling is very good and should not be an issue in bright rooms. The contrast of the Vizio D Series 4k 2018 is excellent.  Blacks look great and this improves the picture quality when the TV is is viewed in a dark room, and especially for dark movie scenes. This TV does not have a local dimming option. 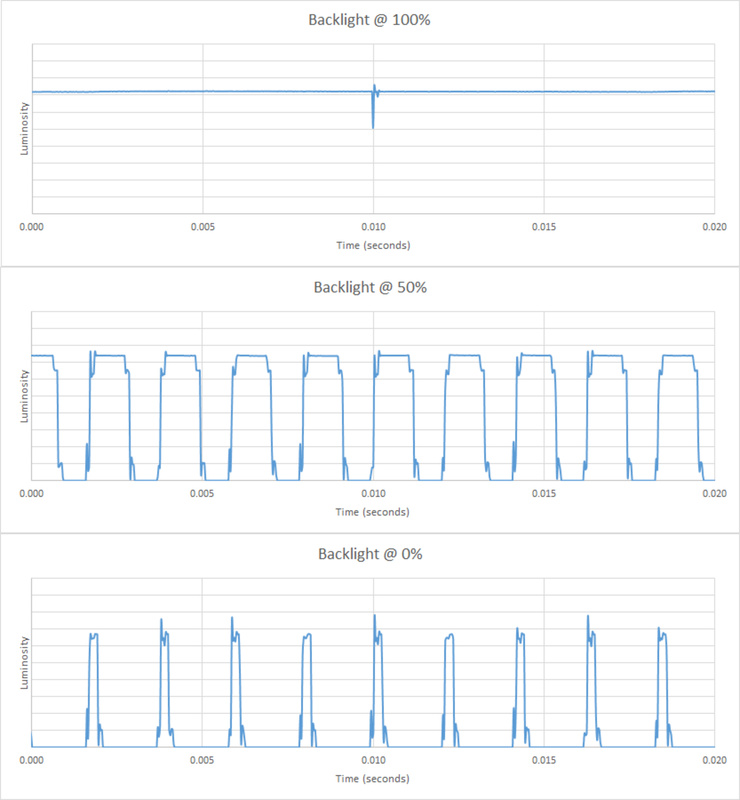 The Vizio D65-F1 SDR peak brightness is good. 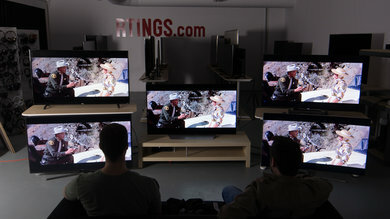 The TV achieves brightness levels that are good for a dark room and satisfactory for a brighter ambiance. It is worth noting that the TV brightness level remains uniform no matter the size of the highlights. The Vizio D series 4k 2018 has ok HDR peak brightness. It does not get very bright to display bright highlights as the creator intends, but it does not dim highlights and it displays a steady brightness no-matter the window size. 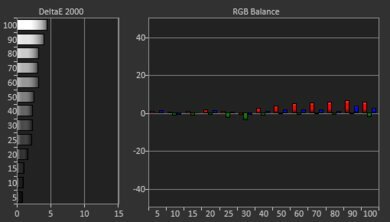 If you find HDR content too dim, raising the Backlight setting to 100 (rather than the default 50) and setting the Gamma to 1.8 will brighten most HDR shades, but unfortunately won't affect peak highlights. 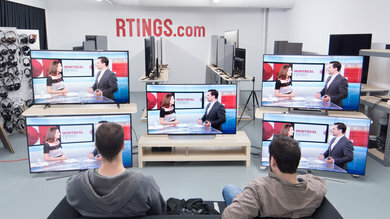 Also during our testing the TV got stuck once at 70 cd/m², but resetting the picture mode fixed the issue. The gray uniformity is decent. 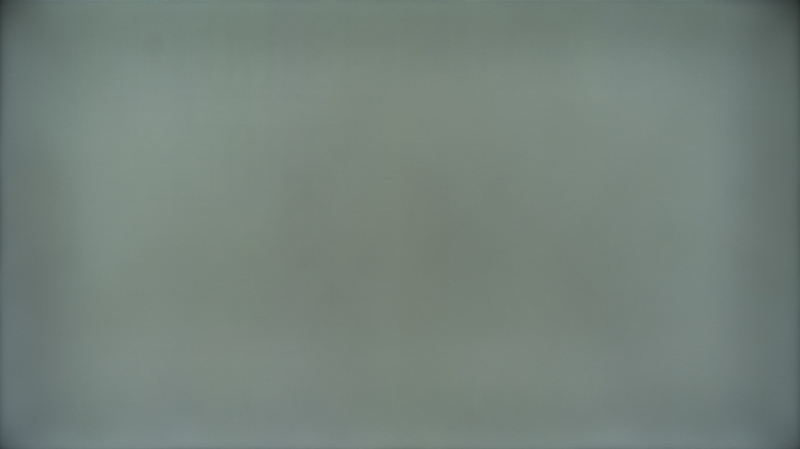 On the 50% gray uniformity test picture, we can see that the four corners are a slightly darker than the center. Some clouding is apparent which causes a little dirty screen effect which might annoy some people when viewing sports. On the 5% gray uniformity picture, things are a little better as not much clouding can be noticed. The viewing angle is bad for this Vizio D Series 2018. 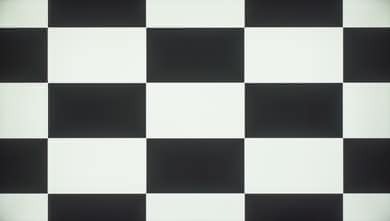 Blacks fade to grey at only small angles off the center and colors shift rapidly at an angle as well. It is not a great choice if you plan on placing it in a wide room. 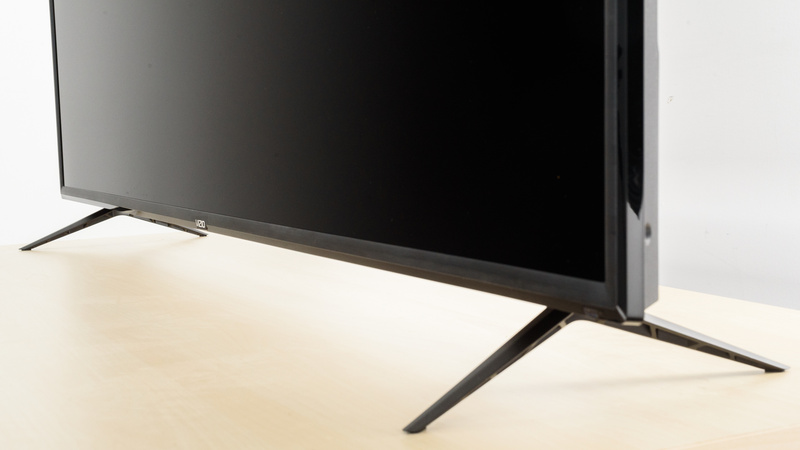 The Vizio D65 has an impressive black uniformity. The screen is uniform and does not show signs of clouding. This is very good, especially for dark scenes. The Vizio D Series 4k 2018 is good at handling reflections. 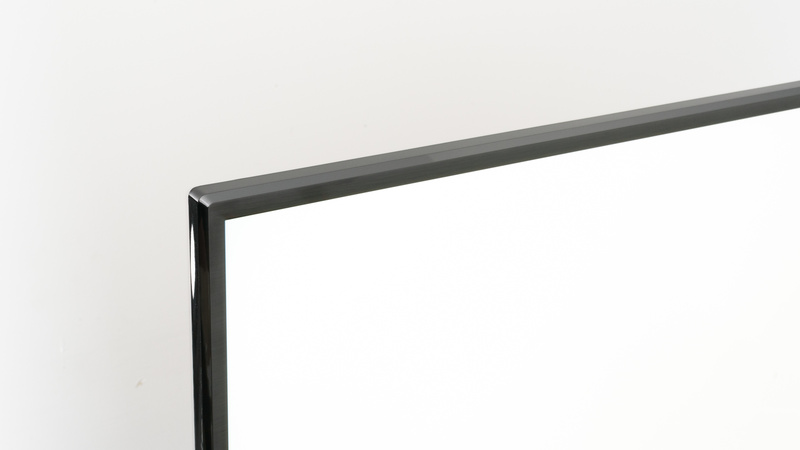 The semi-gloss finish diffuses reflections across the screen, reducing their intensity. Unless you are planning on watching TV in a very bright room, reflections should not be an issue. The TV has very good out of the box color accuracy. When set to Calibrated Dark, the color dE and white Balance dE are well below 3, so most people will not notice any inaccuracies. 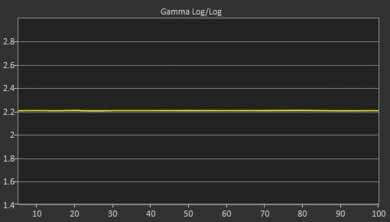 The gamma is at 2.19 almost right on our 2.2 target. 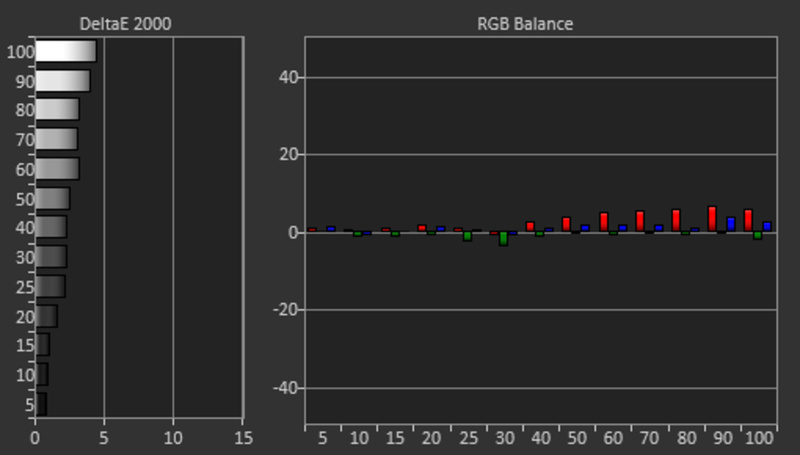 Finally, the color temperature is close to 6500K resulting in a fairly accurate picture. The post calibration picture is close to perfect. The calibration process is fairly straightforward and relatively fast to do. 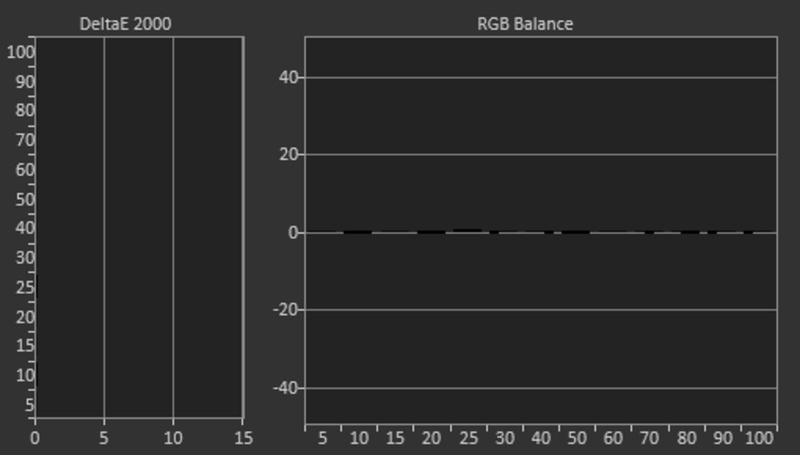 The white balance dE was brought down to 0.08. The color dE was slightly harder to minimize, but the residue is so small that most people won't notice. 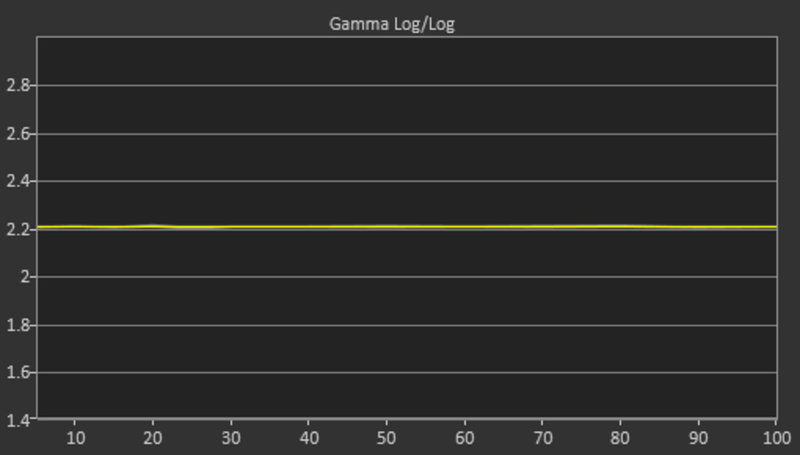 Finally, the gamma is tracking perfectly our goal of 2.2. 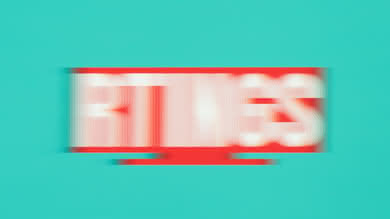 Upscaling of low-quality content is slightly worse than average. 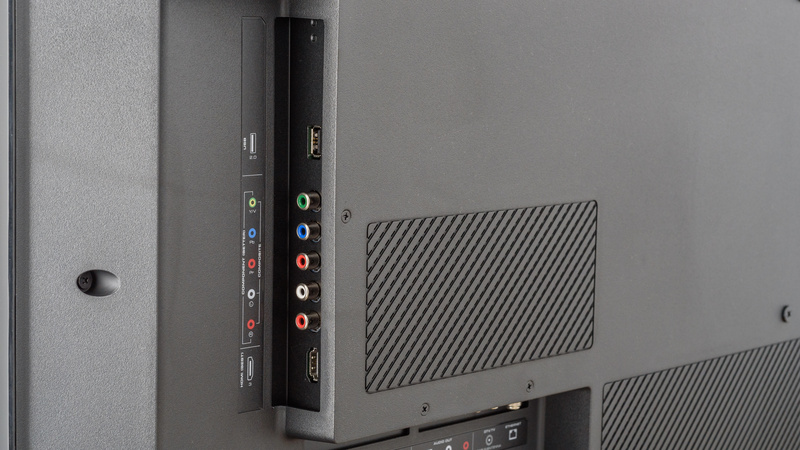 Similar to other Vizio TVs, DVDs appear a bit soft but there is some choppiness to the image. 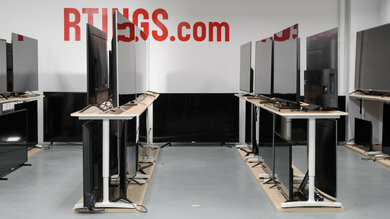 You can see a comparison of the Vizio M Series and TCL 6 Series here. 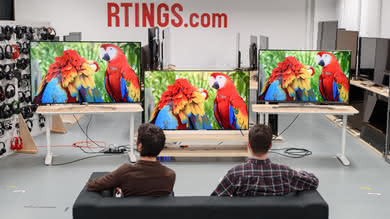 720p sources such as cable TV are a bit softer than most other TVs. 1080p content such as Blu-rays look good. The image remains clear and sharp. No issues can be seen with native 4k content. The color gamut is decent, but the TV fails to be classified as having a wide color gamut since the cover of the Rec 2020 uv space fails to surpass our target of 67%. The HDR EOTF in the Calibrated Dark picture mode follows the target PQ curve well at first, but then begins its roll-off really early, so well-lit areas of HDR scenes will be shown less bright than intended. 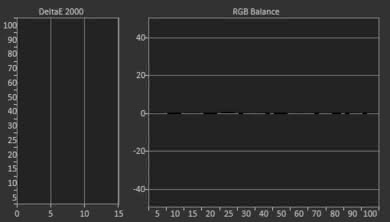 If you find HDR content too dark, raising the Backlight setting to 100 and setting Gamma to 1.8 will raise the EOTF and brighten most HDR scenes. Enabling Game Low Latency doesn't change the EOTF, which is good, and the EOTF in the Computer picture mode is also very similar. 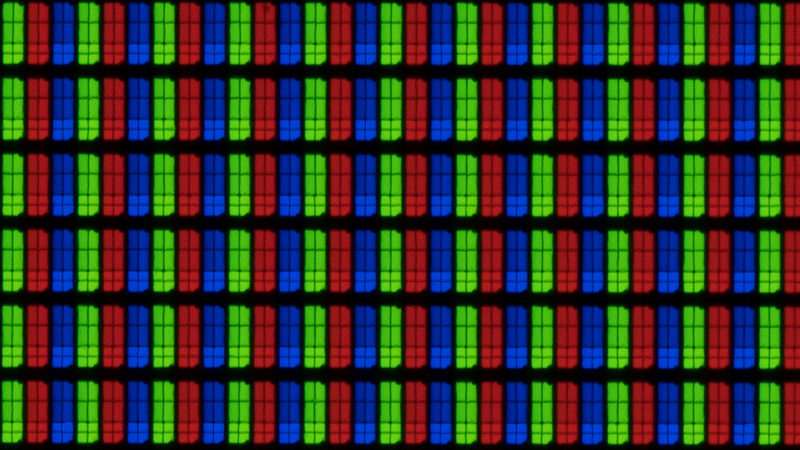 The color volume on this Vizio D Series 65 is mediocre. The inability of the TV to display a full range of colors across a range of brightnesses esteems from the limited color gamut. 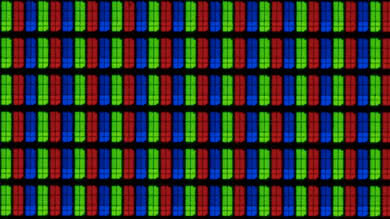 Colors on this TV will not be very rich and darker color shades will be crushed. The gradient is very good. 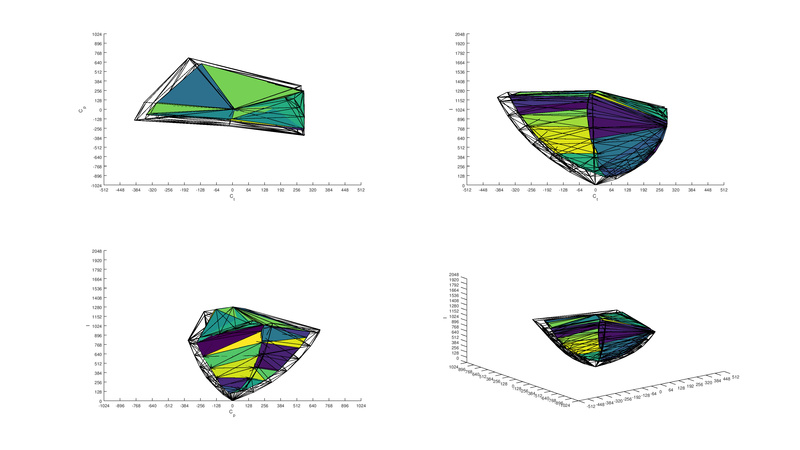 A little banding is present almost everywhere, but only in the dark green and gray you might spot a little more. 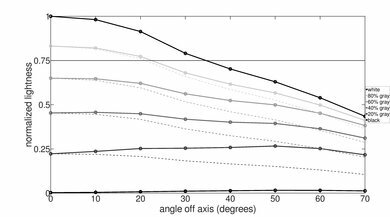 There is no gradient smoothing feature but, the TV has a Reduce Noise feature that may help reduce banding in low quality content. 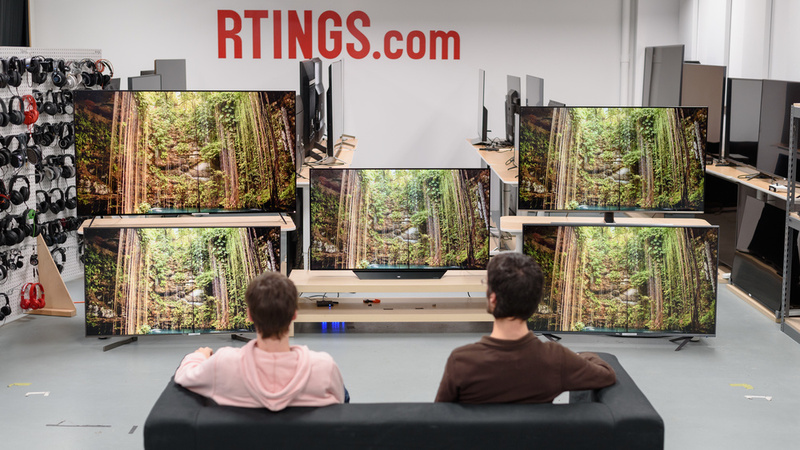 No image retention is present and this is in line with other TVs that use VA panels. The Vizio D Series has ok motion handling. It has a panel with a fast response time, which is good because the TV can handle fast action well without much blur. At the same time in slow fps content, some stutter is visible, which is due to the lack of motion interpolation that cannot be removed. 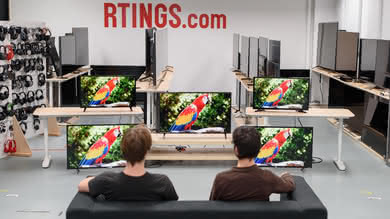 The TV uses PWM to dim the backlight at a fast rate and should not be noticeable to most people. Finally, the TV will remove judder if the 24fps is not coming through a 60p or 60i source. The Vizio D Series 4k 2018 has an excellent response time. There is very little motion trail behind fast moving objects. 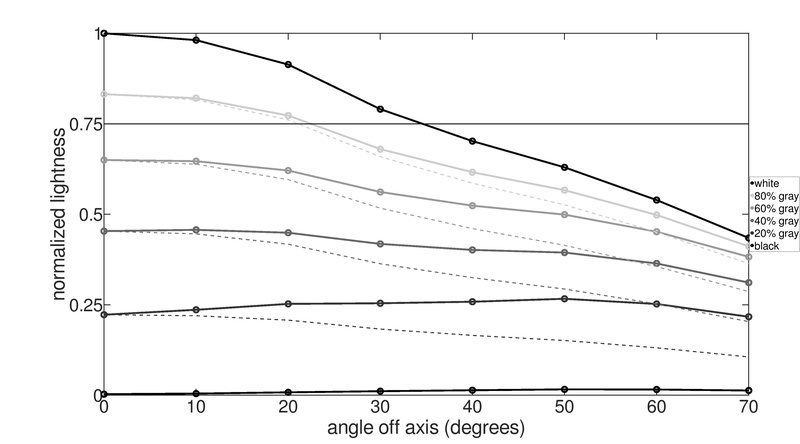 The little overshoot that exists in some transitions, is not likely to cause any artifacts. The TV uses PWM to dim its backlight, so the backlight flickers at all Backlight settings below 100. 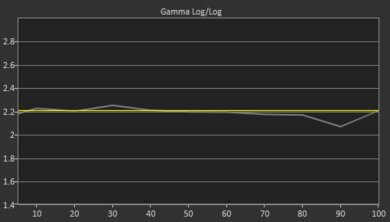 The flicker frequency is at 480 Hz, which is high so it isn't very noticeable except in small duplications behind moving objects. 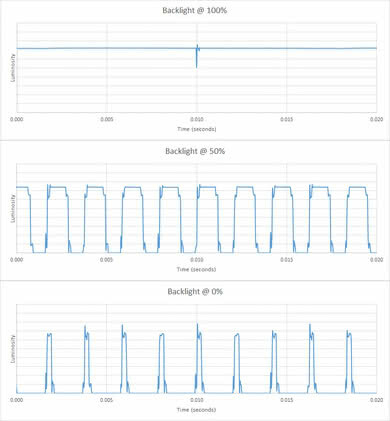 Also we noticed that the backlight also dips down at every 1/60th of a second (60Hz) as shown in in the backlight@100% plot. This should not be noticeable to most and should not worry you. The D series does not support BFI. 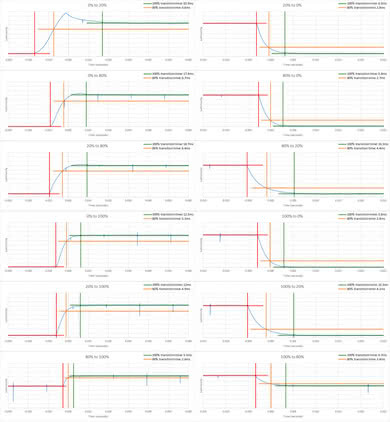 Update 03/29/2019: The 120 Hz for 120 fps test was scored incorrectly. The score has increased slightly. 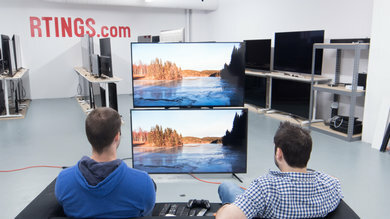 The Vizio D Series 65 does not have any motion interpolation features unlike the higher end P Series 2018 or the TCL 6 Series. 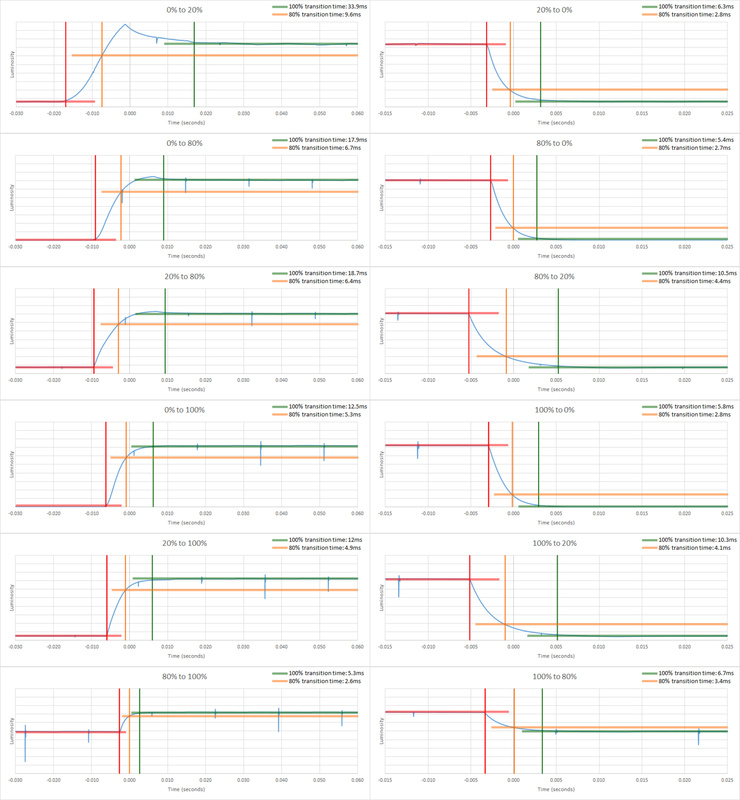 In 24p, some stutter is noticeable because of the fast response time. Unfortunately, the TV has no motion interpolation to insert in-between frames and thus you can only rely on the minimum blur created by the response time to smooth it out. The Vizio D Series 4k can play 24p content from the native apps, or a DVD or a Blu-ray without judder. To remove judder set Film mode to on. 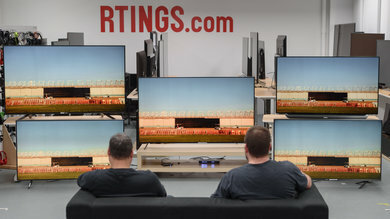 When the 24fps is coming through 60i or 60p then just like the 2017 model the TV is not able to remove it. 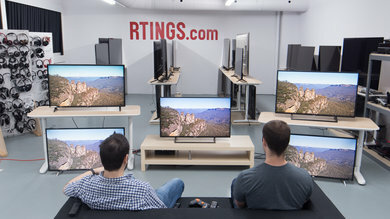 The Vizio D65-F1 doesn't support any variable refresh rate features. The Vizio D Series has a very low input lag both for SDR and HDR content. 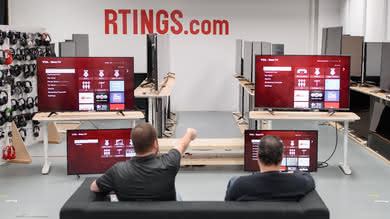 This makes the TV feel very responsive to user input which should keep happy those who plan to play games on the TV. 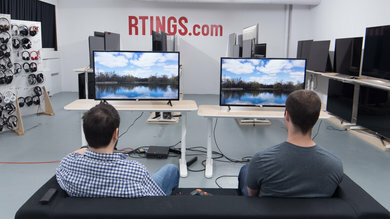 This year's model supports a variety of input resolutions but no support for 120Hz or for 1440p is available. 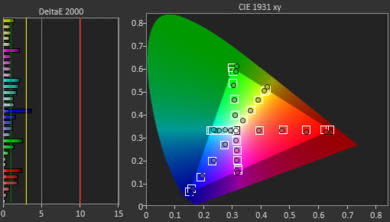 Finally, the Vizio D65-F1 can display 4:4:4 color on all ports, as long as you set it to Full UHD Color. It's worth noting that the TV comes equipped with a TV tuner. The input lag is very low. To achieve low input lag you must set the Game Low Latency to on, You can do that from any picture mode so we recommend using the Calibrated Dark picture mode. 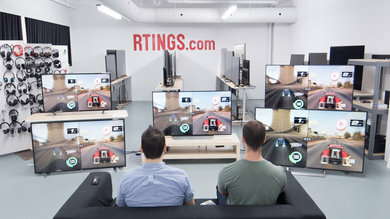 4:4:4 is only shown properly in the Computer picture mode and the Game Low Latency must be enabled for low input lag. 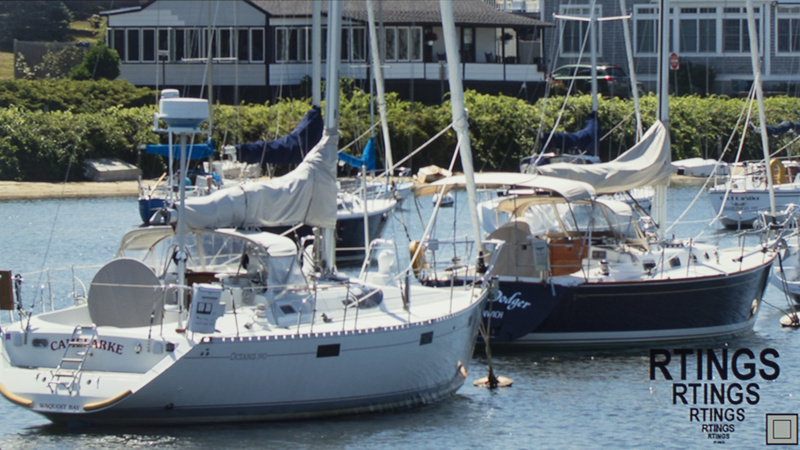 It is however enabled by default when a 4:4:4 signal is sent and thus it is grayed out. 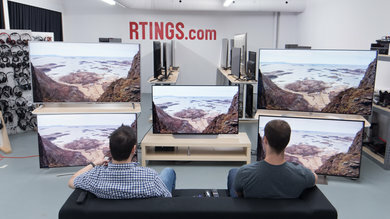 The D Series 65, like other mid-low end Vizio models, does not support 120Hz. It does support most common resolutions at 60Hz except 1440p. 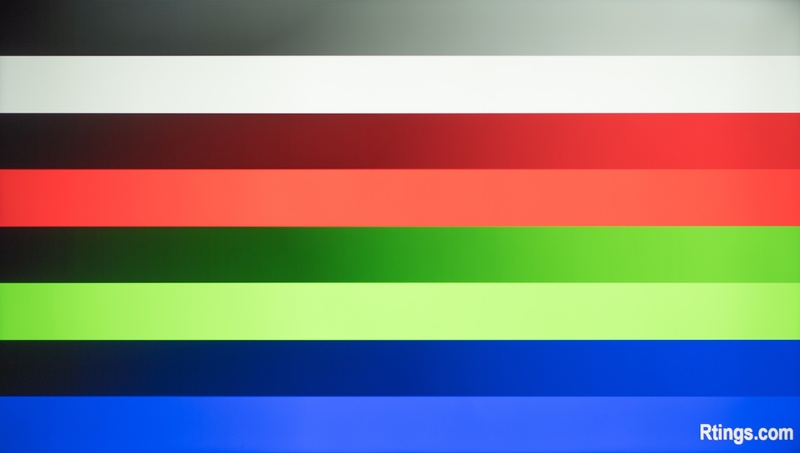 Only in Computer picture mode can 4:4:4 color be displayed properly, and it only works only when Full UHD Color is enabled. 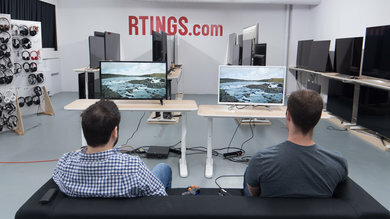 4k @ 60Hz @ 4:4:4 + HDR is also supported. 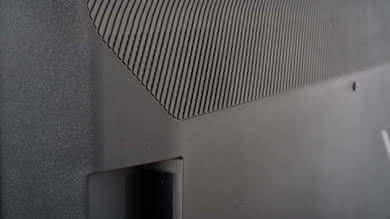 There is a shared component/composite input on the side inputs of the Vizio D65-F1. 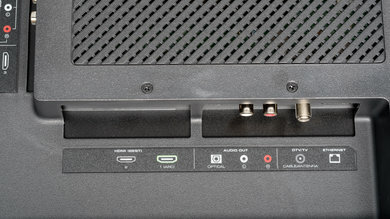 Just like the other 2018 Vizio models, in this D series the Digital Audio Out had to be manually set to Bitstream for DTS passthrough (Optical and ARC) to work. If set to Auto it stays in PCM. The sound quality of the Vizio D Series 65 is sub-par. This TV doesn't produce much bass and gets only moderately loud. It also lacks a bit of detail and brightness in its treble range, which is not good for producing clear and easily understandable dialogue. For a better sound, soundbars or dedicated speakers are recommended. 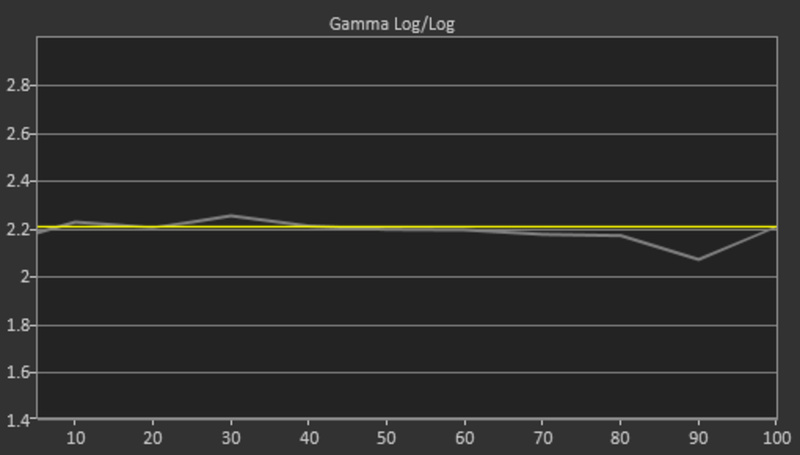 The frequency response is sub-par. LFE (low-frequency extension) is at 170Hz, which is inadequate. This means that the bass of this TV won't have any thump or rumble, and will lack quite a bit of punch too. The response above the TV's LFE is also sub-par as the underemphasis in the treble range will negatively affect the intelligibility of dialogue. Additionally, this TV get doesn't get very loud, and doesn't have a room correction system. The distortion performance is mediocre. 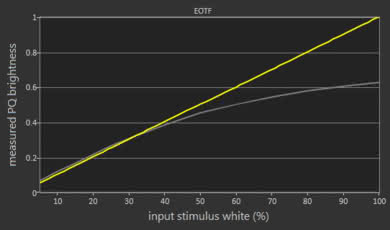 The overall amount of produced THD is elevated, which tends to make the sound impure. But there is not a big jump in THD under maximum load, which is good. However, this TV doesn't get very loud. 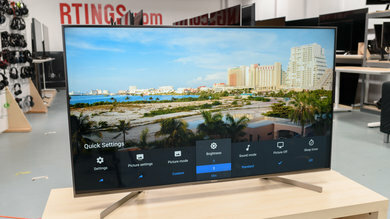 The Vizio D Series 2018 uses the Vizio SmartCast smart interface. 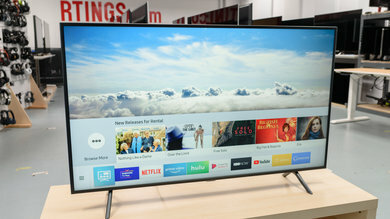 It is the same interface found in the rest of the 2018 line of Vizio TVs. 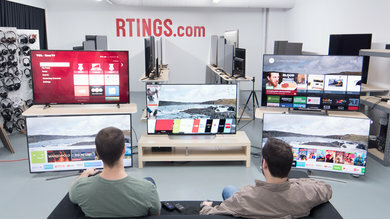 It has very basic features but comes equipped with built-in Chromecast media streaming support, allowing you to control the TV from your phone. You can stream files from any app that supports casting. The TV comes with some preinstalled apps that cover the basics. Unfortunately, since there is no app store there is no way to add additional functionality except through a firmware update. The interface is slow and basic, with no animations. There is noticeable lag when browsing the TV shows and movies tabs. 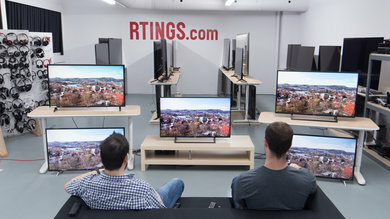 (in our test after 3 pictures the TV was stalling for a short period of time before becoming fluid again). Also during our HDR testing, the TV got stuck once at a really dim 70 cd/m², but resetting the picture mode fixed the issue. 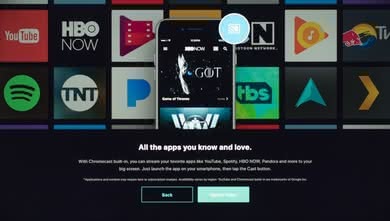 The TV does not have ads in its interface or its SmartCast app. There is a limited selection of apps and smart features on the Vizio D Series 4k US version. 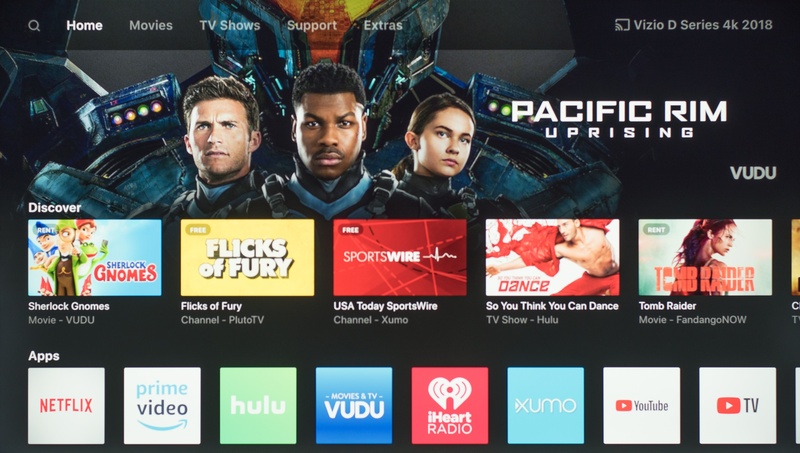 The 18 apps present were: Netflix, Prime Video, Crackle, VUDU, iHeart Radio, YouTube, Newsy, Dove channel, Curiosity stream, Con TV, Pluto TV, Haystack TV, Xumo, Plex, Fandango Now, NBC, YouTube TV and Hulu. Note: These are the US Region apps. Other regions might have different apps installed. There is no app store but any app supported by Google Cast can be cast. 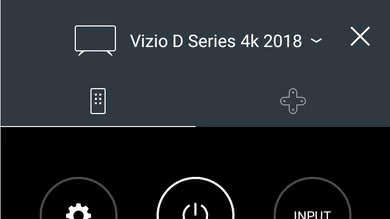 Update 11/15/2018: Vizio has added a 'WatchFree' input via a firmware update. This uses the free Pluto TV service on the backend, and is well integrated. 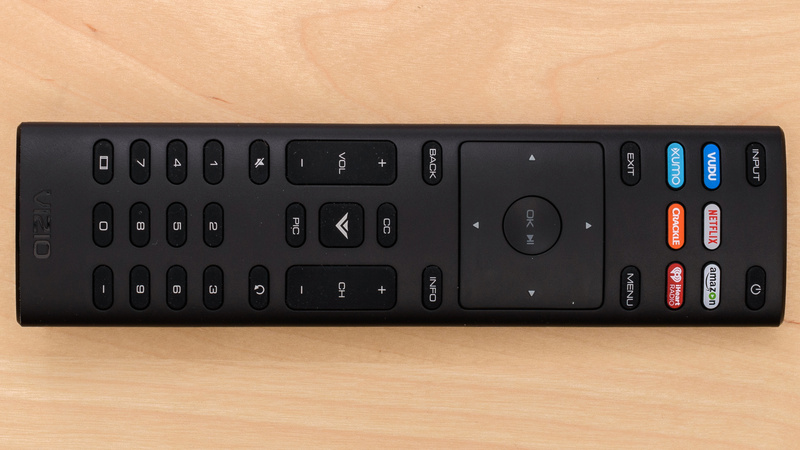 Very basic and lightweight remote, same as Vizio E Series 2018 and M Series 2018. Small buttons, hard to read for some, but intuitive layout and easy to use. There are 6 button shortcuts for various streaming services at the top of the remote. There is no voice control built into the remote or on the TV, but if you have a separate Google Home or Amazon Alexa device they can interface with and control the TV. The remote app is good. It can change inputs but not open apps. You can't use it to cast files from your device but third-party software can be used to cast files to the built-in Chromecast. It should be noted that it cannot execute voice commands. 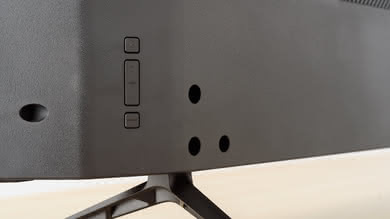 The TV has buttons for power, volume up/down and changing inputs, just like most other Vizio TVs. The Vizio D Series TV that we bought is the 65" with SKU D65-F1. Different sizes may have different panel provenances, so if your Vizio D Series 4k 2018 doesn't correspond to our review, let us know and we will update the review. Note that the gray uniformity does vary between units. Note: The D43-F1 variant comes equipped with 8-watt speakers whereas all the others come with 10-watt speakers. 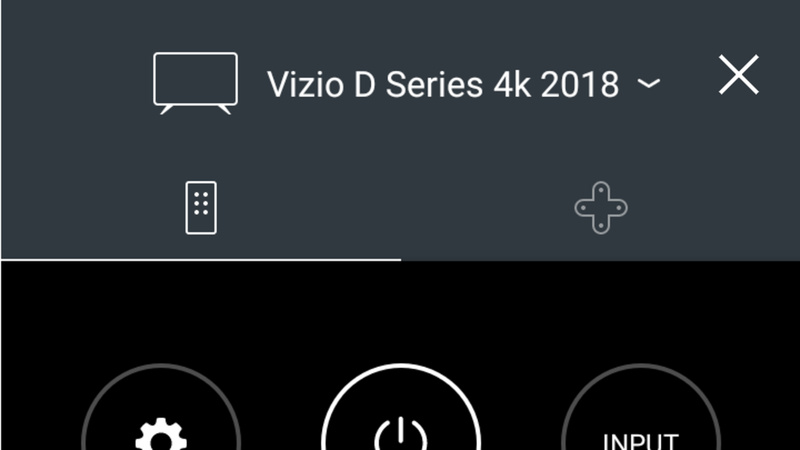 Update 12/12/2018: Vizio has released the V505-G9, which appears to be a variant of the D Series 2018. 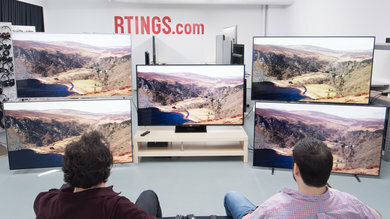 It is only available in 50", and as far as we can tell, the only difference is the addition of Dolby Vision support, and possibly an adjustable BFI mode to reduce persistence blur. There may be other differences that we are not aware of. 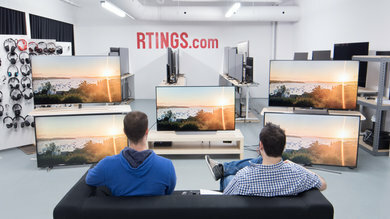 Top left: Vizio E-Series 2018 (E65-F0) . 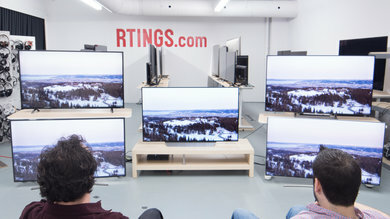 Bottom left: TCL 5 Series 2018 S517 (55S517 ). 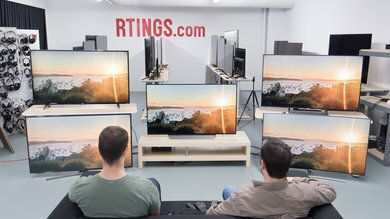 Middle: Vizio D-Series 4k 2018 (D65-F1). 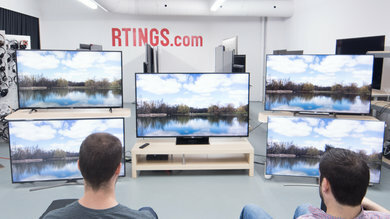 Top right: LG UK6300 (43UK6300PUE ). 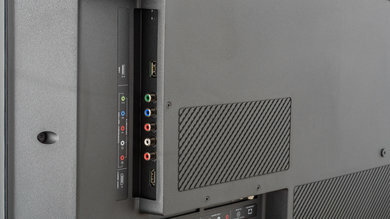 Bottom right: Samsung NU7100 (UN55NU7100FXZA ). Unlike our other photographs, this picture wasn't taken under a controlled environment, so do not draw conclusions from it. The Vizio D-Series 4k 2018 is a good low-mid-range 4k TV with a few minor flaws. 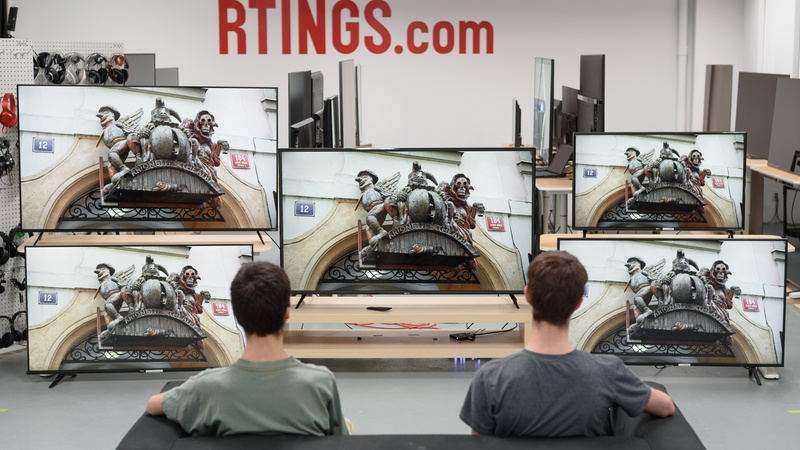 See our recommendations for the best cheap TVs. 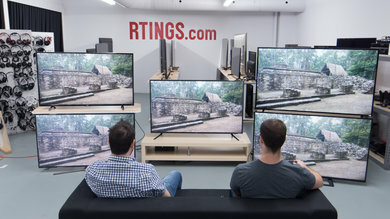 43" 50" 55" 65" 70" 75"
The Vizio E Series 2018 is a bit better than the Vizio D Series 4k 2018. 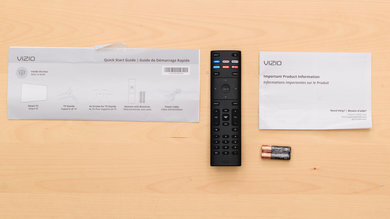 The Vizio E Series has a local dimming feature, although it isn't very effective. The E series has an optional Black Frame Insertion feature that can help clear up motion. The E series also supports Dolby Vision, which doesn't add much but is a nice extra. 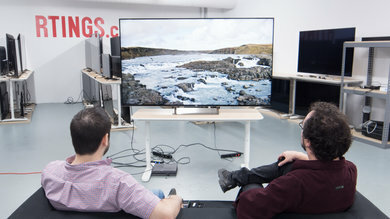 The Vizio D Series 4k 2018 has wider viewing angles, good if you have a large seating area. 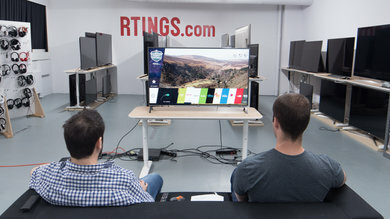 The Samsung NU7100 and the Vizio D Series 4k 2018 have very similar performance. The Vizio D Series 4k 2018 has a faster response time which is great for fast action.  It can get slightly brighter and can handle reflections better which is great for watching TV shows. 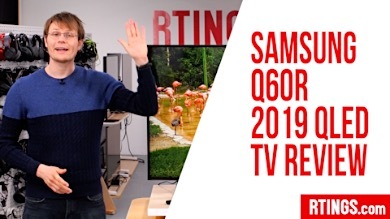 The Samsung NU7100, on the other hand, has lower input lag for gaming and better motion interpolation for those who like the soap opera effect. It also has slightly better 720p upscaling that is better if you watch a lot of cable TV. 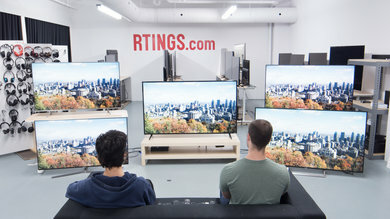 The TCL 5 Series S517 and the Vizio D Series 4k 2018 have very similar performance. The Vizio D Series 4k 2018 has better reflection handling and better response time that make it a better choice for sports watching, whereas the TCL S517 is better for movies since it supports motion interpolation. The TCL also has lower input lag which makes it more responsive, and this is important when gaming. The Hisense H9E Plus is a bit better than the Vizio D Series 4k 2018. The H9E Plus features a wide color gamut, great for HDR, and has much better motion processing as it can interpolate content as high as 120 fps and can remove judder from all sources. 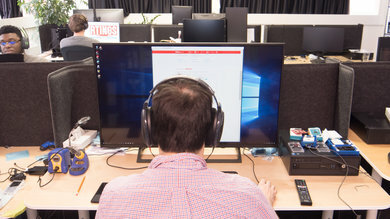 The Vizio D is better for use as a PC monitor, as it displays chroma 4:4:4 without issue. 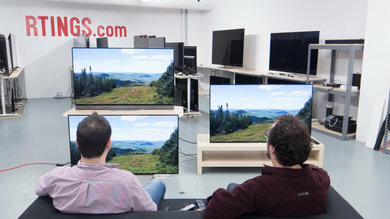 The performance of the Vizio D65-F1 for mixed usage is okay. 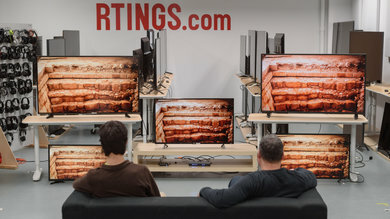 Movie and regular cable TV watching is decent, whereas playing video games and using it as a PC monitor should keep you satisfied. 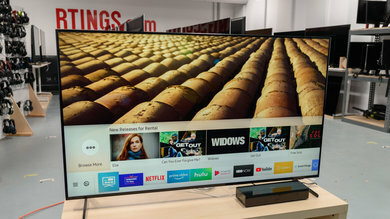 This TV does not have a great HDR performance since it has a limited color gamut and will not display rich and saturated colors, far from what the content creator intended. This TV is decent for watching movies. It has a very good contrast ratio that will display good blacks in dim environments but lacks any local dimming to further boost blacks.  You should not observe much clouding in darker scenes since the TV's black uniformity is very good. 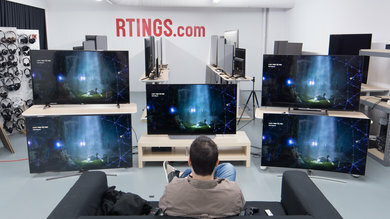 Watching 4k and Blu-ray content looks great. Watching TV shown on the Vizio D Series 2018 is ok. The TV can get good enough brightness levels for brighter rooms and can handle reflections well. 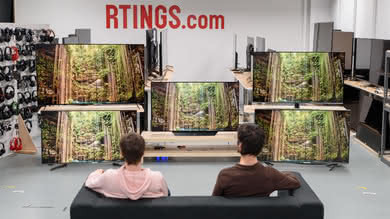 Unfortunately, viewing angles are not very good and thus the picture quality will not be the same if you are watching a TV show while moving around doing some housework. On the other hand, upscaling 720p cable content is ok. This TV is decent for watching sports. The good reflection handling and the great response time. 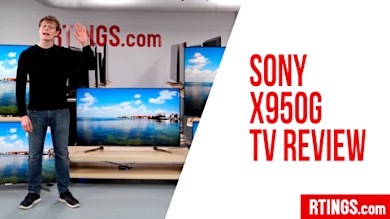 make it a good choice for watching fast action sports in a room with a few lights. Some dirty screen effect is present and that will disappoint sports fans. Also if you plan to watch a game with a big group you take into account that the bad viewing angles do not favor wide seating arrangements. The Vizio D Series 65 is very good for playing video games. It has a low input lag both in SDR and HDR content, which makes it very responsive to user input, and also has a remarkably fast response time which is great for fast action. Ordinary performance for this TV on HDR movies. Apart from the great contrast and the great 4k content display, this TV is producing a satisfactory result for HDR movie watching. This is mainly because it cannot display rich and saturated colors due to its limited color gamut. Playing HDR games on this TV is good as it supports the 4k @ 60Hz + HDR input. Also, the fast response time makes it suitable for fast action. The good contrast will offer a decent experience in dark scene HDR gaming. 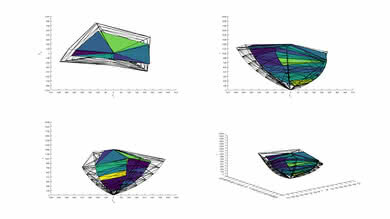 However, you should keep in mind the limited color gamut which will not allow it to display rich and vivid colors. 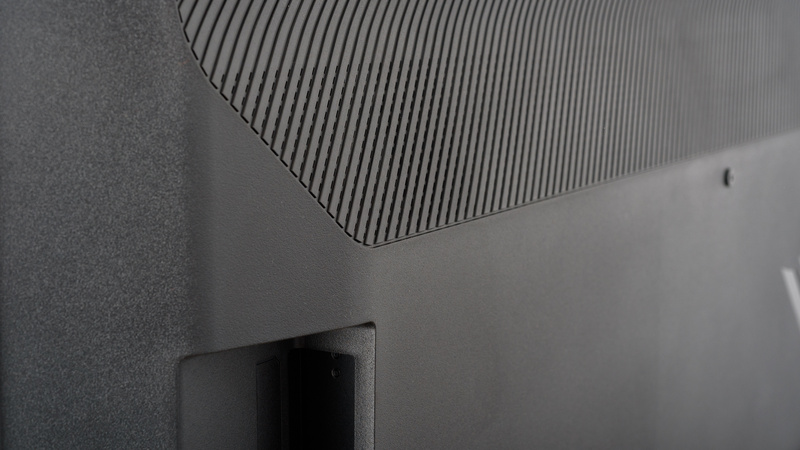 This Vizio D Series will perform very well as a PC monitor mainly due to its remarkable input capabilities. The various supported resolutions and the low input lag should keep most people happy. Also, the fact that there is practically no permanent burn-in risk and no temporary image retention, should not deter you from using it as a PC monitor.